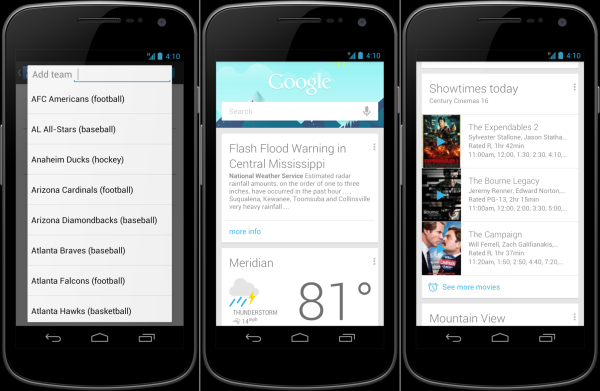 If you're sporting Android 4.1 Jelly Bean then one of its most notable features just got better, as an update for the Google Search update is enhancing Google Now (still getting adjusted? check the guide book for a list of commands) functionality in a few key ways. The new version brings public alerts to your Now page, with emergency messages like storm warnings or earthquake alerts, so if you're in range of Hurricane Isaac, it may be worth grabbing sooner rather than later. A more trivial change lets sports fans manually select their favorite teams from 140 pro soccer, baseball, basketball and hockey clubs -- we tried to find our college favorites and were denied, for now. While trying to automatically decipher our preferred squads from searches is nice, it might not be practical when we're just looking up information on our fantasy football players so this should be a help. It has also added support for movie listings as seen above. Search for a flick that's in theaters and you will not only receive relevant information, but also when and where it's playing in your area. If that's not enough, it can be set to pop up on your "movie days" or when you just happen to be loitering outside a theater. Finally, in a move that should please many prospective Galaxy Note II owners it is ready to work in Korea -- grab the new version of the app at the link below.